Jean Sophie Hewitt attended the same art school as Mary Garman. Later she trained as an ballet dancer. Her family were connected to Robert Graves and Allen Lane. In the early 1920s Mary introduced Jeanne Hewitt to her family. She told her, "You and my brother Douglas will fall in love." Douglas Garman did fall in love with Jeanne and they began spending a lot of time together. According to Cressida Connolly, the author of The Rare and the Beautiful: The Lives of the Garmans (2004): "Mrs Garman was especially fond of Jeanne, and both mothers were delighted when the engagement was announced. In London, the Hewitts and the Garmans were constantly in and out of each other's houses and rented rooms." 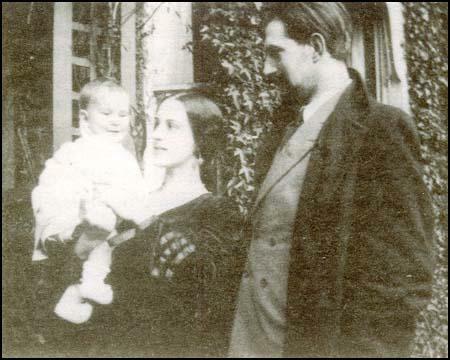 Douglas and Jeanne eventually got married and moved to a flat in Milman Street in Bloomsbury. Their first and only child, Deborah, was born on 5th January 1926. Soon afterwards, Garman decided to move to Penybont. His best friend, Edgell Rickword, and his girlfriend, Thomasina, went with them to their new home in Wales. Douglas Garman and Edgell Rickword were both socialists and in 1926 attempted to support the miners during the General Strike. Garman was very disappointed when the Trade Union Congress called off the strike. In November, 1926, the Garmans decided to travel to the Soviet Union. For the next six months Garman gave English lessons in Leningrad. Jeanne Hewitt and Douglas Garman with their daughter Deborah. 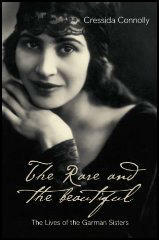 Garman's relationship with Jeanne became very difficult in the late 1920s. In 1932 Jeanne and her sister Lisa, visited Mary Campbell and Roy Campbell in Martigues. According to Cressida Connolly: "It seems that Mary and Jeanne became lovers at this time, and Mary's letters attest to a brief romance... It was during the same visit that Campbell began an affair with Jeanne's sister Lisa... who like her sister, was a considerable beauty." Jeanne eventually left Douglas Garman and went to live with a young actor. Garman began an affair with Peggy Guggenheim. In 1936 it was agreed that Jeanne would have responsibility for her daughter Deborah during term-times but she would stay with Douglas and Peggy during holidays. This worked well as Peggy had a daughter, Pegeen, of the same age. Peggy later wrote: "Garman and Debbie moved into Yew Tree Cottage, and I found myself once again the mother of two children. I loved Debbie. She was just the opposite of any child I had ever known. She was so mature, calm, sensible, self contained and well behaved, and so little trouble. She was intellectual like her father and loved to read and to be read to. She had a wonderful influence over Pegeen, and Pegeen over her. She became less priggish in our home. They got on marvelously and were soon like sisters." Jeanne asked Garman for a divorce. 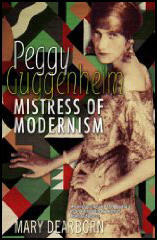 According to Peggy Guggenheim: "Garman said I would have to be co-respondent. I protested violently because Mrs. Garman had left Garman long before I met him, and I considered this most unfair. But Garman said I was living with him, and there was no other way to do it, since he would not divorce his wife. The whole thing was very silly. We had to be found in a room together, Garman in a dressing gown and I in bed. A detective came down from London early in the morning, so that the children would not know about it. After that he wanted to come again, but Garman said he would not go through it a second time, it must suffice." Among these girlfriends was a young ballet dancer named Jeanne Hewitt. She and Mary had met while attending the same art school, and at once found each other congenial. Like Mary, Jeanne was one of a large family, which shared the Garmans' interest in music and the arts. Several of the Garmans and Hewitts got to know each other during the early 1920s, and were on friendly terms. Kathleen gave piano lessons to some of the younger Hewitts. Later, when Mary brought Jeanne home to stay with her family, she told her, "You and my brother Douglas will fall in love." And they did. Against his better judgment Garman decided, because of my insistence, to come and live with me in Yew Tree Cottage and bring his daughter Debbie with him, When we told this to Kay she had the impudence to ask me how I could take the responsibility of looking after Debbie. It was rather strange considering she had brought up Sindbad for over five years. I told her Debbie was so responsible she would look after all of us. Kay basked in the idea of my being an incompetent mother in order to prove her superiority. When we got home Garman and Debbie moved into Yew Tree Cottage, and I found myself once again the mother of two children. I loved Debbie. She was just the opposite of any child I had ever known. She was so mature, calm, sensible, self contained and well behaved, and so little trouble. She was intellectual like her father and loved to read and to be read to. She had a wonderful influence over Pegeen, and Pegeen over her. She became less priggish in our home. They got on marvelously and were soon like sisters. They used to dress up in a strange collection of old clothes and costumes we kept in a chest, and gave charades, plays and all sorts of performances. Kitty, Garman's niece, was the third actress. Their only audience was Garman's mother, her lady companion and myself, and occasionally Garman, when he could be torn away from his intense intellectual life. In the evening I read to Debbie and Pegeen while they ate their supper. Garman was wonderful to the children. They adored him. But one day Debbie said to him, "Pa, you look so monotonous." When we asked her what she meant, she replied, "You know, sort of going on and on." Garman wanted to instruct the children in the facts of life and procreation. He drew all kinds of diagrams for them, which meant nothing to Pegeen. Finally we reminded her of the times when she had seen dogs mating. She was so horrified that she turned to me and said, "Mama, you mean to say that you did that?" and then as an afterthought she added, to put everything right, "Of course, only twice to make me and Sindbad." She (Peggy Guggenheim) did not have the emotional resources to live alone, she feared, calling the prospect "Eternal Danger." She was forced by circumstances - Garman's ties to London and his work for the cause - to shift for herself, though, and along the way she began to see that she did have the wherewithal, and that she wanted to find some meaningful occupation. Also troubling Peggy and Garman was Garman's divorce. His wife wanted to marry again. All Debbie's related grownups wanted her to live with them at term time, but they finally decided that Garman and Peggy would have the ten-year-old until the summer of 1936; her mother would then have her during term time, and Peggy and Garman for holidays. Peggy felt guilty, picturing herself in the role that Kay Boyle had played with Pegeen and Sindbad and keeping her so-called stepdaughter from her mother. "It is awful to think of making another woman suffer as I do about Sindbad,' she wrote Emily. Garman had the upper hand, she went on, as his wife had left him: "A divorce is difficult because we are all living in sin." Eventually Garman gave his wife what she wanted, allowing Peggy to be named as a correspondent and saving his wife the ignominy of being caught with her new friend in a compromising position. At the same time Kay managed to get under Peggy's skin by questioning her ability to take responsibility for another child. Garman's wife wanted to marry again. For years she had been in love with a young actor and finally decided she wanted a divorce. Garman said I would have to be co-respondent. I protested violently because Mrs. Garman had left Garman long before I met him, and I considered this most unfair. But Garman said I was living with him, and there was no other way to do it, since he would not divorce his wife. "The whole thing was very silly. We had to be found in a room together, Garman in a dressing gown and I in bed. A detective came down from London early in the morning, so that the children would not know about it. After that he wanted to come again, but Garman said he would not go through it a second time, it must suffice. The divorce was granted on the "humble petition of Mrs. Saddie Garman." It read that Garman and I had sinned not once, but many times. I often wondered how they knew.